The best parts of this recommendation for bone health are the side effects of consuming healthy calcium sources. Fruits, beans, greens, and other vegetables have multitudes of other nutrients working together to promote health in numerous ways. You will be eating for your bones but also for your heart, brain, kidneys, and just about every organ in your body. Leave the baby cow food aside and eat the foods designed and packaged by nature for humans while getting plenty of exercise and a reasonable amount of sunshine. Because of some of the evidence suggesting milk is unhealthy, I suggest you skip the cow’s milk. However this does not mean that calcium is unimportant. Calcium is vital for bone health. Bone health is incredibly complex, involving many other nutrients like protein, phosphorus, vitamin D, and sodium and lifestyle factors like exercise. Government-recommended calcium intakes are controversial and could themselves be the topic of a huge, long discussion, but the bottom line, in my opinion, is that individuals should consume at least 500mg of calcium daily from a whole-foods, plant-based diet. In one European study, vegans had a 30% higher risk of fracture compared to meat eaters, but they also had a significantly lower calcium intake than all the other groups. When researchers only considered vegans who ate at least 525mg of calcium a day, they found that vegans had no increased risk of fracture. In other words, the increased risk of fracture disappeared when consuming at least 525mg a day. If you are eating a whole-food, plant-based diet, you can get over 500mg of calcium a day without thinking twice about it. Below is a chart showing the calcium content of a sample of many types of plants, with whole milk listed for comparison. Certain greens are particularly rich in calcium, but all whole plants have some calcium. You can take this to another level by considering absorption of the calcium. Roughly a third of calcium in milk or calcium supplements is absorbed. Certain low-oxalate greens have a significantly higher proportion of calcium that is absorbed (kale, mustard and turnip greens, bok choy, broccoli, to name a few). Some beans (and occasional high-oxalate greens, like spinach) have a lower percentage of absorbable calcium even though they have relatively high total calcium3. As mentioned before, if all of your calories are coming from whole plant foods, including plenty of fruits, greens, beans and other vegetables, you don’t need to think twice about calcium requirements or do any fancy math or milligram counting. You’ll be fine. However, many people avoid greens, beans and other vegetables. In the standard American diet, it has been estimated that we get about 75% of our calcium in the diet from dairy foods. So if one cuts out all dairy foods we’ve got to replace it with the “good” foods. Some people don’t do this, so I do worry about calcium intake for the following scenario: vegans (or meat-eating dairy avoiders) who eat mostly processed foods, including unfortified snacks and grain-based foods with lots of added sugar, fat, and salt. 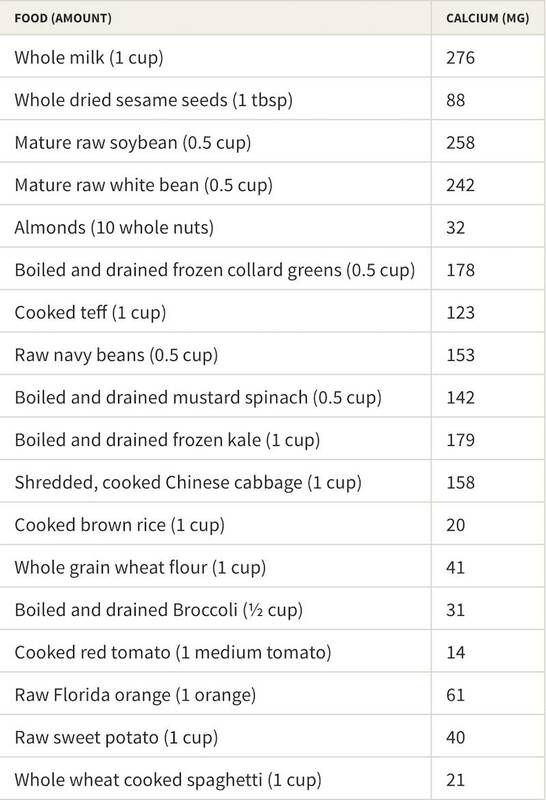 Often these may be the folks who are trying to transition to a healthier diet who aren’t yet quite “digging” the cup of beans or cup of cooked greens I recommend every day (these are minimum suggested amounts). I am guessing that these are the types of diets likely found among vegans in the European study mentioned above linked to higher fracture rates. For these scenarios, I do encourage certain fortified processed food intake. For example, many non-dairy milks are highly fortified with calcium. I believe these to be the easiest calcium source. Additionally, many cereals and juices are fortified. In addition, if tofu is made using calcium, it too has high calcium content. For those people who are avoiding dairy who don’t eat many fruits, vegetables, beans or greens (there are lots of these folks around), I do recommend being mindful to consume a serving of nondairy milk or some other highly fortified food that suits their tastes on a daily basis. And lastly, lest we get too carried away with calcium obsession, realize that bone health is strongly influenced by whether you exercise your bones. Adult bone density and bone mineral content can be strongly influenced by exercise, particularly in adolescence. In fact, exercise in adolescence may be much more important to adult bone mineral content than calcium intake. Get outside, get some sun and use those bones! PS – There is more information about calcium supplementation in the upcoming book The Campbell Plan. Additionally, there are conditions where calcium intake recommendations may be different than what I describe here. Discuss with your physician if you have specific clinical concerns. Appleby P, Roddam A, Allen N, Key T. Comparative fracture risk in vegetarians and nonvegetarians in EPIC-Oxford. Eur J Clin Nutr 2007;61:1400-6. Keller JL, Lanou A, Barnard ND. The consumer cost of calcium from food and supplements. J Am Diet Assoc 2002;102:1669-71. Weaver CM, Proulx WR, Heaney R. Choices for achieving adequate dietary calcium with a vegetarian diet. Am J Clin Nutr 1999;70:543S-8S. Lanou AJ, Berkow SE, Barnard ND. Calcium, dairy products, and bone health in children and young adults: a reevaluation of the evidence. Pediatrics 2005;115:736-43. Thomas M. Campbell, MD is medical director of the T. Colin Campbell Center for Nutrition Studies, co-author of The China Study and author of The China Study Solution. He is co-founder and clinical director of the groundbreaking UR Program for Nutrition in Medicine.